The 'C' couronné poinçon was a tax mark used in France on any alloy containing copper between March 1745 and February 1749. 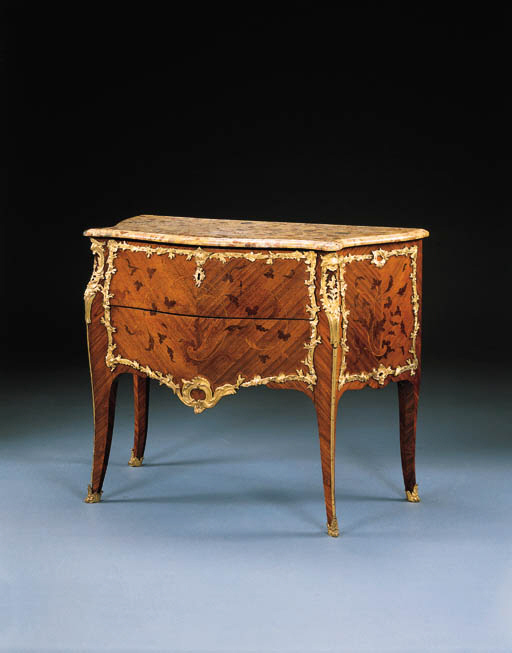 A commode by D.F. with virtually identical mounts is illustrated by A. Pradère, Les Ebénistes Français de Louis XIV à la Revolution, Paris, 1989, p. 177, fig. 161., while another closely related commode was sold in these Rooms from the collection of Sylvia and Emma Jackson, 8 May 1991, lot 116. The skillfully chamfered panels of the backboards of this commode are also typical of Desforges' constructional techniques. The fact that his output is exclusively of lacquer-veneered furniture supports the theory that this example was reveneered, although the quality and depth of the veneers suggests this may have been executed in the 19th century, possibly by an English dealer-restorer such as E.H. Baldock.